This page is great for spatial thinking and finding a set of flash cards that are actually fun. This is a great page for practicing your subtraction. It does simple facts. Give it a try. A shooting game that requires lots of basic number skills. Number Twins: click here to use strategy and basic facts at the same time. Crash into cars with the right multiples. A great way to practice up for multiplication. This site is a great place to play math games, do flashcards, and even find worksheets. This way you can get your math on at home. 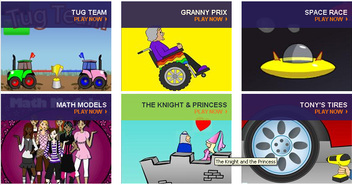 There are so many learning games on this site that it's hard to name them all. Math. Vocablulary. You name it. This is a great resource to teach yourself or your child about an idea in mathematics. At the bottom, it has questions to see of you really understand each idea. We might on using this for homework sometimes. Enter your level of difficulty and what operation you want (+, -, x, div. ), and then go for it. Try to select add or subtract with up to 10 facts. If you try for 10 minutes, see if you can beat 4 or 5 seconds on average. Please play only level 1 first. If you master that, feel free to move one to level 2. This game is a great way to work on your multiplication facts in a fun way! Science fiction math facts with Gordon! This is hard to figure out at first. There are many places to practice your basic facts on it though. I like the way it makes my brain work. It should be great for learning your facts. Lucky drops is similar to Alien Munchtime. It helps with multiplication. Enjoy! This is another multiplication game that you can try. Give it a shot. There are at least 12 free games here. They are from the creator of Lucky Drops and the diver game. Try these out for fun. Be sure to READ the instructions on this page and make sure that you complete all the exercises all the way through. These are a large number of tools that you can use to SEE the mathematics that you are doing. It's a great way to help yourself "get it." These tools will be more helpful to you as you go up through the grades. This game allows you to get collections of money and count it up--just like in real life. This games allows you to subtract money from a cash drawer based on what you need. In this game students will count various US coins and match the pictures of the coins with the correct amounts.